Adding heating will also go a long way towards inviting you outdoors when the temperatures drop. There are some beautiful freestanding and hanging gas heaters that can also be made into a design feature – or alternatively, strip heating can be both functional and discreet. Built-in fireplaces will also add beauty and functionality. Retractable awnings or permanent options such as pergolas, gazebos and pavilions create a more intimate feel and help to trap heat in outdoor spaces and offer protection from the elements. To add texture, think about using timber, exposed brick, detailed concrete and smaller textured titles. You can’t go past timber for warmth and organic tone – and you don’t need to go over the top with it, either. 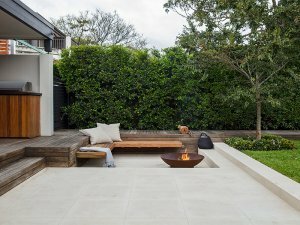 It can be as simple as adding a timber bench or a stack of freshly cut timber in a fire-pit area. As for colour, take your cues from autumn’s warm and earthy palette – neutral warm tones plus hues of blue and pink will keep your space looking both warm and on trend. If you can only prioritise one element, fire pits are the autumn must-have. 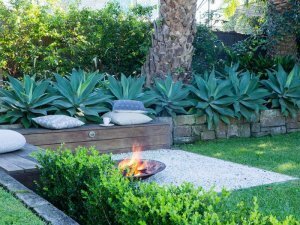 A fire pit will act as a great source of warmth and light and create a classic, cosy campfire ambience for family and friends to enjoy as the weather gets cooler. I personally love the style and functionality that comes with a built-in fire pit. I’m yet to meet someone who doesn’t enjoy sitting around a fire with loved ones and there’s a great range of iron or steel bowl options on the market. Deciduous trees can inject beautiful warmth and striking colour as autumn sets in – and there’s something special about actually seeing the seasons change and transform your garden. Some great varieties include sapium, cercis, pyrus and maple trees. Pruning trees and plants to remove any dead or diseased wood is important heading into winter, as it will help to maintain the architecture of your trees and ensure your garden remains inviting. 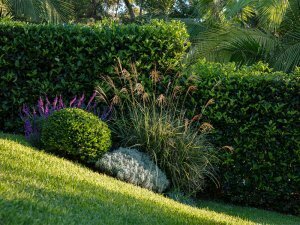 Pruning can also open your garden up to more sunlight, which is helpful as the days get shorter. Make sure you do this well before your garden is exposed to serious cold or frosts. It’s also important to mulch garden beds to add insulation for cooler weather and it will also help neaten things up after pruning. If you don’t have the time or interest in garden maintenance, it’s worth getting a professional in to manage it for you. It will ultimately cost you a lot less than if you have to rip up your lawn and garden because they go unloved. 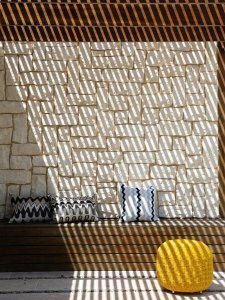 Follow these six tips to create a killer – and totally inviting – outdoor space this autumn!